FAQ - How do I share a Phone Alert in Livingtree as an admin? 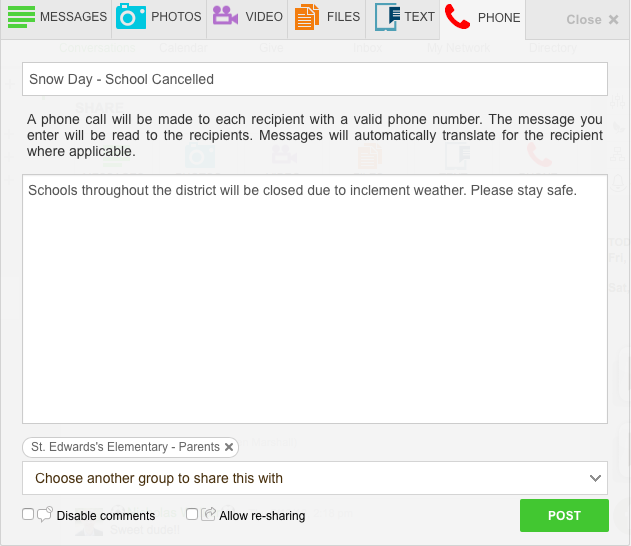 How to share a Phone Call Alert as a school and/or district administrator in Livingtree . Begin by clicking in the Message creation box found on the Livingtree Conversations page. To share a Phone Call Alert, click the PHONE button, enter your Message in the field and select who you would like to receive a call. Your Message will be sent as an Email Notification, Mobile Push Alert, PHONE call (or voicemail) and as a Livingtree POST.